Thank God for the assurance of His presence with us through all the changing scenes in life, and especially in our difficulties, trials or afflictions. What a comfort! Shalom Nancie. Beautiful waves and fitting words from Isaiah! I'm going over to Word-Filled Wednesday center now to find out what it's all about. A great reminder! Love the picture you chose for this verse! oh I love that verse! I appreciate this thought - knowing that God assures us he is going to hang around for the long haul brings peace and comfort. Thanks for sharing! I love Isaiah because it's what I feel is the most encouraging book in the bible for me; This is one of the scriptures that I have highlighted in pink to remind myself of God's assurances. Love the picture. The scripture was perfect for my circumstances. Isn't that great how our God works. Encouraging verse and beautiful photo! Thanks for sharing. Hi! Your verse for the day makes me stand even taller.... IN CHRIST! Hi, Nancie. What a beautiful, peaceful verse and picture! 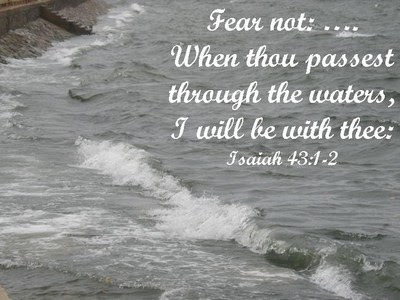 I love that God is with us as we pass thru the waters. It's hard to trust that isn't it? It is for me, when I see the waves coming and I feel doom all around and the voices of the enemy drown me with lies...Ah, but the promises of God are true and unfailing! After a few episodes of whining and falling apart during the "waves" times in my life, only to find that I'm still standing, unbelieving but standing, I'm learning to look at those waves coming and trust in God's promise to not destroy me. I hope to ride the waves like a surfer in my spiritual life and to walk on the waters like Peter if the Lord will call me out to do so! I love the verse you chose! Wonderful reminder...thanks for sharing that. God bless you! The words jumped out from my monitor...hugging me! Thank you so much for being one of God's instruments...have a blessed day! Lovely and powerful. It reminds me of the Fishers Of Men. Your post just made my day again! I was having trouble with the word verification yesterday so came back today~yeah, double blessings! Thank you so much for sharing some of the beauty that surrounds you.